There’s a saying in Italian: fritte son bone anche le scarpe, meaning “even a shoe tastes good when it’s fried”. Well, I’ve never actually tried fried shoe, but I couldn’t agree more when it comes to seafood. It tastes especially delicious when it’s fried—good enough to convince even the piscatorially challenged. 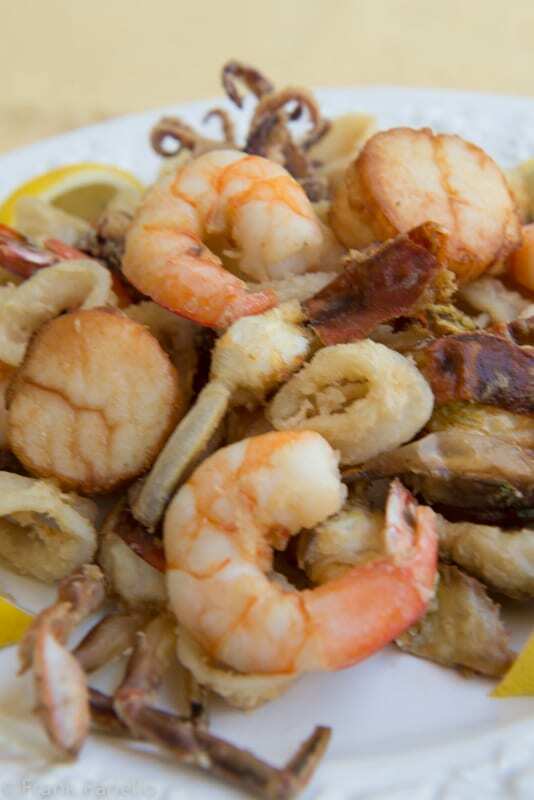 The fritto misto di mare, a platter of assorted fried seafood is hugely popular in Campania but found all over Italy. It will always include crustaceans and mollusks, typically shrimp and squid, and often very small whole fish, such as fresh anchovies or sardines, or baby mackerel or mullet, collectively known as paranza. Here in the US, you might look for fresh sardines or smelt; they are hard to find but occasionally make an appearance, especially in areas with large Italian-American communities. But you should really feel free to include whatever seafood that’s fresh and available to you locally. For today’s fritto misto di mare, I couldn’t find any tiny fish in the market, but I did spy some local soft shell crabs, as well as some gorgeously plump scallops, which were a rare and expensive treat back in Rome. A fritto misto di mare is sometimes batter-fried (see Notes below), but the simplest and my personal favorite method is the one we’ll present today: The seafood is lightly coated in flour and quickly deep fried in hot oil until golden brown. If you ask me, there’s no better way to prepare seafood. If using soft shell crabs, cut them in half down the middle vertically, then horizontally, so that each crab makes four pieces. The small fish, assuming you fishmonger has cleaned it for you—can be cooked as is. Now it’s time to fry. Heat your oil in a fryer or a deep cast iron pot until it is very hot. In a deep fryer, just crank the temperature up as high as it will go, to a temperature of 190C/375F. If using frying in a pot, then use a [deep frying] thermometer if you have one; if not, then heat it until just before the oil begins to smoke. Deep dry the fish quickly in the hot oil, until the seafood is just cooked through and a light golden crust has formed on the outside. This should take no more than 2-3 minutes. Avoid overcooking the fish. NB: Unless I’m dealing with a single portion, I like to flour and fry each type of seafood separately, as they do cook at slightly different rates, with the shrimp or smaller bay scallops taking almost no time, while the squid and crab can take a bit longer, as can larger scallops. In any case, don’t overcrowd the deep fryer and proceed in batches if you need to. Once all your seafood is cooked, transfer them to a serving platter (preferably lined with paper towels to soak up any excess oil), sprinkle lightly with salt, and serve your fritto misto di mare with lemon wedges. It is crucial to serve fried foods as soon as possible after they’re done, while they’re still nice and hot and crispy. As they say in Naples, frijenno e magnanno—which, loosely translated, means “fry it and eat it”. But if you really need to make it ahead, or if you have so much fish that some is already cold by the time the last of it is done, you can return all the fish to the deep fryer for a quick dip to warm up—but this should literally just be for a few seconds. Then drain again and serve. 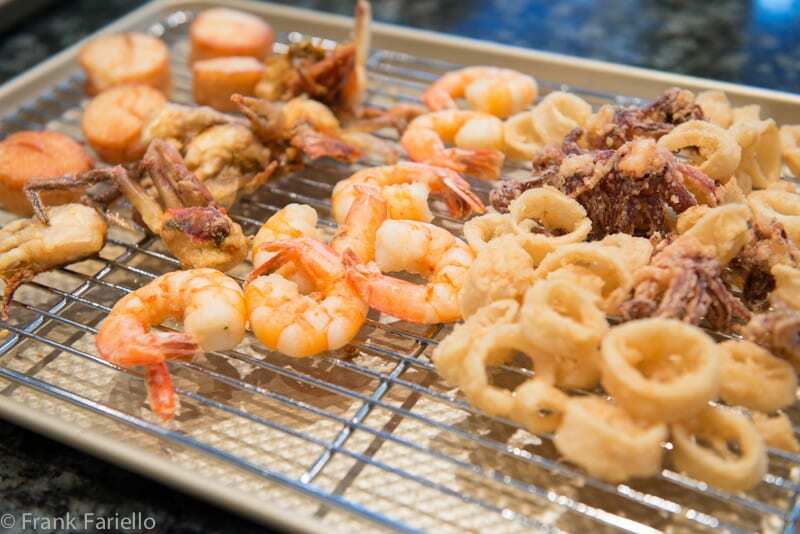 My main tip for making a great fritto misto di mare is avoid overcooking the seafood. While I usually advise balance when deep frying meat or vegetables—not too hot, not too cool—for seafood, which cooks very quickly, I find the best method is to fry at the highest temperature possible, for the shortest time possible, just long enough to cook the seafood through but not a moment more. The result is seafood as it best, sweet and briny and juicy. Taste a piece before serving—you’ll be surprised how little salt or other seasoning it actually needs. As mentioned, a fritto misto di mare can be made with a light batter of flour, olive oil and enough water to make a cream-like mixture. Some batters call for adding egg to the batter, which you can add whole or, if you want to get fancy, add the yolk and then (just before frying) fold in the egg white, which you will have whipped into a foam. Egg batters, especially if you whip your egg whites, will be quite thick. You need to let any batter sit for about an hour before using. Make sure you’re seafood is quite dry before coating with your batter, or the batter will tend to slip off in the frying. Batter-fried seafood take a bit longer to cook than when lightly floured, so increase the frying time by a minute or two. For the oil, while some recipes, especially the older ones, call for olive oil, for deep frying at high heat I find peanut oil or the more reasonably prices safflower oil, does a better job. As for the flour, it is the subject of some controversy. Some recipes call for hard-wheat flour, others insist on soft “OO” flour, some on semolina. I simply use the kind known here in the US as “All Purpose” and it works just fine. And while a fritto misto di mare generally doesn’t include vegetables, unlike a meat-based fritto misto which almost always does, occasionally you will find a recipe that calls for some slices of zucchini or other summer vegetables; these are always fried covered in batter, even if your seafood isn’t. Flouring the Seafood: Now lightly flour your seafood. 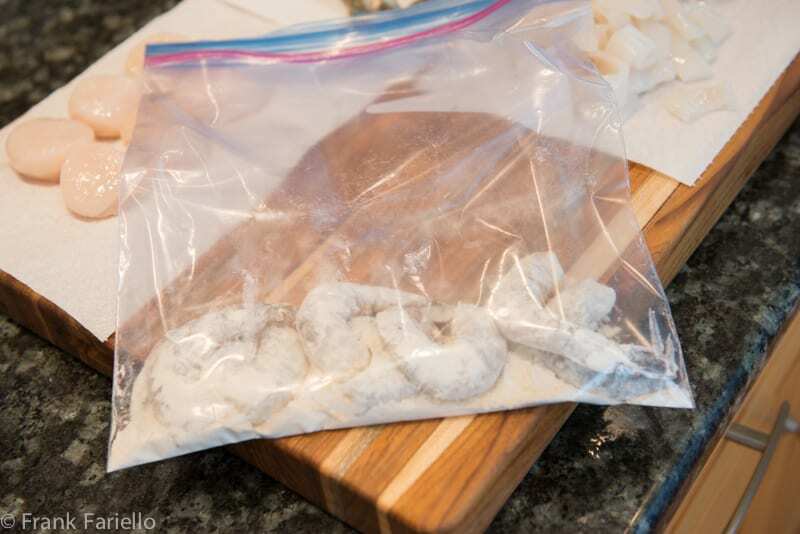 I like to do this by placing my seafood in a plastic bag, then spoon in 1-2 spoonfuls of flour, and shake the bag around until all the pieces are lightly coated. Then pour the contents of the bag into a colander. Shake the colander to eliminate the excess flour. 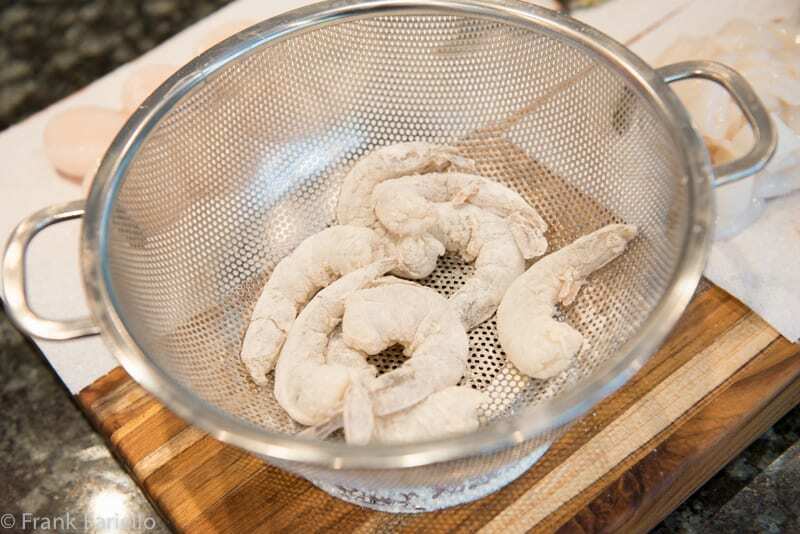 Deep Frying the Seafood: Now it's time to fry. Heat your oil in a fryer or a deep cast iron pot until it is very hot. 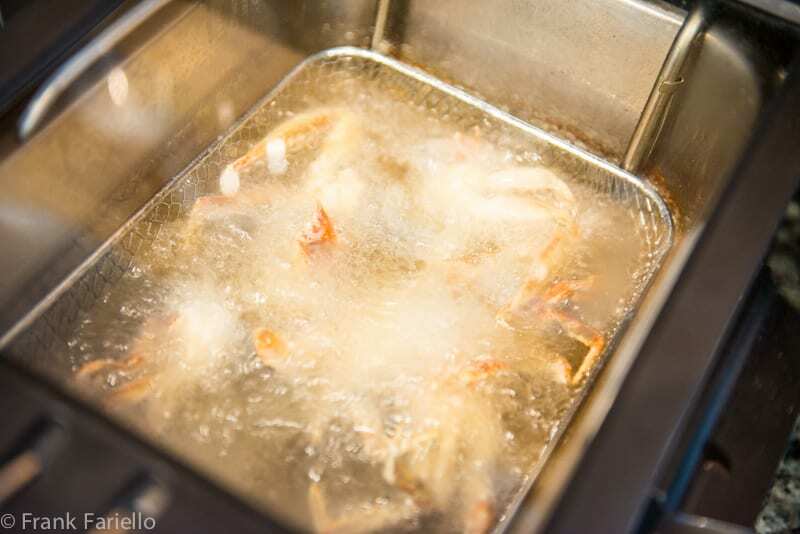 In a deep fryer, just crank the temperature up as high as it will go, to a temperature of 190C/375F. If using frying in a pot, then use a [deep frying] thermometer if you have one; if not, then heat it until just before the oil begins to smoke. Deep dry the fish quickly in the hot oil, until the seafood is just cooked through and a light golden crust has formed on the outside. This should take no more than 2-3 minutes. Avoid overcooking the fish. Drain your fried fish on paper towels or a cooling rack as they are done. 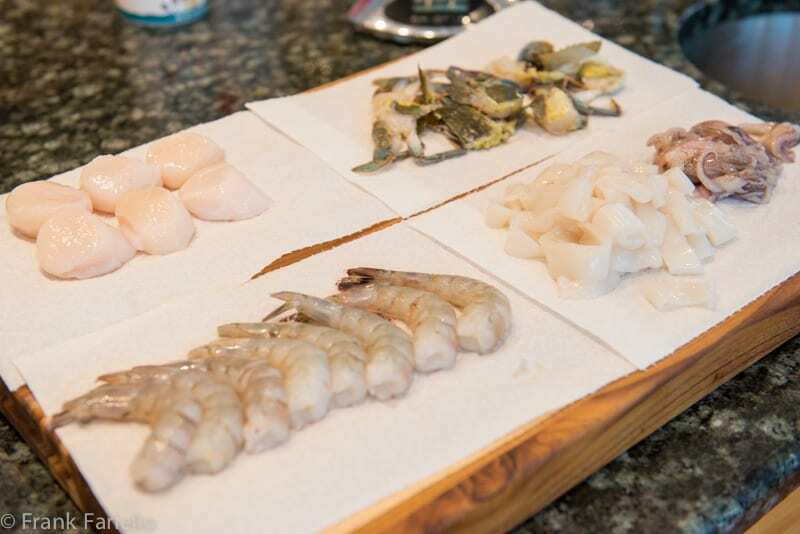 Serving the Seafood: Once all your seafood is cooked, transfer them to a serving platter (preferably lined with paper towels to soak up any excess oil), sprinkle lightly with salt, and serve your fritto misto di mare with lemon wedges. It is crucial to serve fried foods as soon as possible after they're done, while they're still nice and hot and crispy. You’re so right about the squid: “And don’t forget the tentacles”. They are awesome, you just squeeze the beak off and dredge in flour with the sack. So good! As you may have noticed, yes, we’re raving about this:) Do you also eat very small smelt in Italy? We call it Atherina, and it’s perfect for eating it whole, fried in olive oil and served with fresh lemon to squeeze on top. Yep, those small fish (not sure if they’re smelt or some other fish) are very popular. Love ’em myself. An absolute favorite, especially when in Campania. Although the process is simple, you have spelled out the essence of this recipe from start to finish. Following these carefully laid out instructions step by step will insure a delicately fried, crispy and delectable Fritto Misto di Mare. I can never resist fried things (well, I haven’t tried a shoe! ), but seafood is the best. I was just in Spain and Portugal, and had some great fried seafood. Terrific post — thanks. I can imagine how good that seafood was, John! I don’t agree about everything being better when fried, but I’m only half italian! But this looks so so wonderful and I’m just a little jealous that i can’t get beautiful seafood where i live! What a wonderful tutorial to make the perfect fritto misto Frank. For me it’s holiday food. Umbria is one of the few regions of Italy that has no sea and I often miss this treat. A day trip to the coast is in order now that you remind me of it! You mentioned this dish is often made with small fish (paranza). Would those typically be what are known as “smelts” and often served around Easter from my past experience? Smelts or fresh sardines would be what I would look for in the US. Not necessarily the same fish as you would find in Italy but it works just fine. sigh… this recipe brought a tear to my eye. When we visit family in Italy, we go to restaurant called Ai Gabbiani near Caorle. They serve a delicious fritto misto. So good in fact that my sister-in-law doesn’t bother to make it at home. of course prosecco is involved… I was never able to replicate their version of this with the fish that is available on the east coast of Canada, alas! It’s a challenge we face on the east coast of the US, too, Adrienne. So I just go for whatever looks good and enjoy it for what it is. Not the same, but still very good. This is a dish I never make but always order in restaurants. I am liking the simple use of flour and ignoring the batter. Sometimes there is more batter than fish! Delicious! Thanks, Claudia! I’m definitely a minimalist when it comes to deep frying.Let’s that delicious flavor of the fish come through. Haha, love the saying — and very true. We have a decent Italian immigrant community and so there’s some amazing (European) Italian restaurants here. So when we go to one of our favourite Italian restaurants I always order this dish. Thanks Frank! That’s how we make it, Frank! It’s so crispy and perfect. Is it wrong I’d like a plate of fritto misto for breakfast? Looks fantastic! anche io friggo con l’olio di arachide, lo ritengo migliore in assoluto, leggero e resiste alle alte temperature ! Che meraviglia il tuo fritto con un’ insalata ed un calice(anche due) di Prosecco fresco è una magnifica cena ! Grazie, Chiara. Un bel calice di Prosecco va sempre bene! You instructions for this wonderful dish are simple and straightforward , resulting in Fritto Misto they way it is intended to be. Selecting the seafood, flouring, frying, seasoning & serving are all key elements in preparing a proper Fritto Misto di Mare. Thanks, Paula! We aim to please…and inform. Your right about everything tastes better fried. I remember living in the states for a few years — we lived in a small midwestern town — no Italians. Friends of my parents came to visit — they were in Chicago. They brought so many Italian goodies including calamari. My mamma fried them and my papà ate so many that it upset his stomach. They missed the coffee and butter and so many of the things from Italy. Thank you for sharing the fried misto. You’re welcome Marisa! And who doesn’t love fried calamari, right?